I’ve filled chicken breasts with ham and Swiss cheese and baked them, but I’ve never coated them in almonds and Swiss cheese. Now I’ve found this recipe I’m going to give it a try. I think I’ll line the tray with baking paper though to stop them sticking. 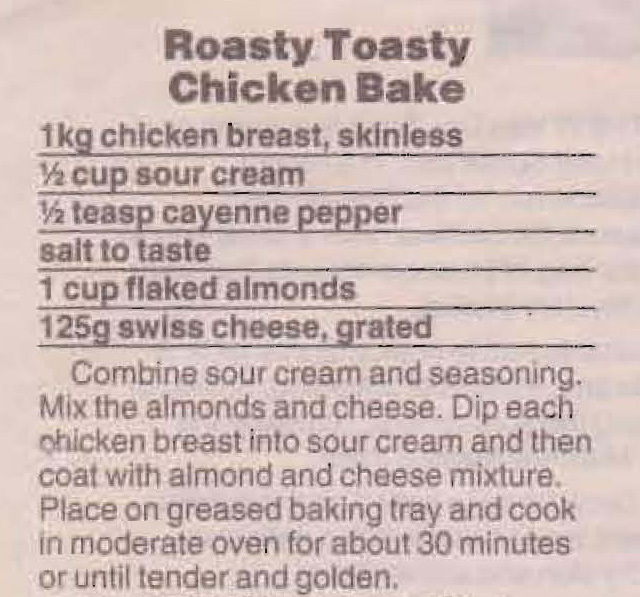 This entry was posted in All Recipes and tagged 1990s, almonds, chicken baked with Swiss cheese and almond coating, chicken breasts, swiss cheese by bebsrecipes. Bookmark the permalink.